Using an exterior stain stripper is typically needed if the old stain or sealer has failed by peeling, wearing unevenly or when changing brands of stain. A stripper will aid in removing the old stain by softening the bond between the stain and the wood cells. This allows easier removal with a light pressure washing or stiff scrub brush. The process of using a wood stain stripper is incorrectly considered difficult. In fact, it will save a substantial amount of time while reducing any chance of damage to the deck with a pressure washer. Remove all furniture from the area. Wear protective clothing, gloves, and eyewear. Mix the Deck Stain Stripper using the manufactures directions. In many cases, it is best to test effectiveness first by applying to a small section. The reason is that all not deck stains are created equal. Many are more difficult than others to remove. Testing first will determine if it will remove the finish or if you may need to use a stronger stain stripper. Apply the stain stripper with a pump up sprayer. Best to do sections of 200-400 square feet at a time. Saturate all wood then wait 10-20 minutes. Test wood to see if slippery. This means that stripper has loosened the stain from the wood. If not reapply the stain stripper one more time. Lightly pressure wash or hand scrub all stain from the wood. Take care to wash with the grain of the wood whenever possible. Repeat if needed until all stain has been stripped from the wood. Spot strip any difficult areas that did not come clean the first time. Very important to thoroughly rinse all wood and surrounding areas to remove the wood fibers, dirt, and grime. Apply a wood brightener to neutralize the deck stain stripper and restore the pH balance of the wood. Failure to apply a brightener will leave the wood in a high "caustic" state that will deteriorate the new deck stain faster than normal. If you have any deck stripping questions please ask below. All questions are typically answered within a day. I had Olympic Semi-Transparent stain put on my brand new cedar deck (installed 6 months ago, stained 1 week ago). I don’t think the contractor prepped the wood well enough before staining and now it is blotchy. I was to remove it and redo it. Do you know the best way? Would I need to strip, sand and clean then stain? Thanks for your help! Strip off what you can. Sand the rest. Brighten all when done. Stripped most of the Behr stain off an 8-year-old cedar deck. It took two applications of the RAD Stripper and manually scraping the boards twice. Now onto sanding to get those last remnants. I had to replace three boards and read that you recommend leaving new boards for four months (or more) before staining. My questions: When I'm done sanding, do I use the RAD brightener right away and postpone staining for four months? Or sand, wait four months, then brighten and stain? Or is there something in-between (stain all but the new right away and stain the whole deck again next year)? Since it is only three boards, just go ahead and do the deck now. You will need to apply another coat to the new boards next year. This is the best Iv'e seen regarding this issue. what product(s) do you recommend to strip the old stai. In my case it's a Behr solid, paint like stain. Thank you. Rod, deck stain strippers will not remove solid color (opaque) stains. You will need to sand this to remove. 2 years ago I applied a water based semitransparent stain on a cedar deck. The appearance deteriorated so I cleaned the wood and then spot cleaned other areas where the stain lingered. See photo. After the second cleaning I noticed some raised grain. Is the only solution sanding? Also, dies a wood brightener do some cleaning in addition to neutralizing? My end goal is letting the cedar age and turn grey. A wood brightener does not clean. It lightens the wood and neutralizes. The raised grain does not look that bad. You could just leave it alone. If you do want to remove, you will need to sand. Have an ipe wood deck that has been neglected for 5 years. Old stain needs to be taken off and then restrained. Not sure how to proceed and if this wood is treated differently. I used Olympic maximum solid stain/ sealent. To remove most of it I used jomax. I need something stronger to get the rest removed. What can I use? Deck strippers will not remove solid stains. You will need to sand it off. I am sorry but we are not familiar with this membrane and if a stain stripper will harm it or not. purchased a home and the stain is not HOA approved. it is almost espresso brown looks black from far away. Is it possible to remove the dark stain in order to stain it a lighter approved stain color? What brand and type of stain is the dark brown? You have to remove the Sikkens first. Try the Restore A Deck Stain stripper. Apply this to the wood and pressure wash off. Repeat any areas that are needed. Apply the Restore A Deck Wood Brightener while the wood is still wet from the stripping. Wait 2-3 days to dry, then stain with the TWP. 2 years ago a contractor built a new deck for me with pressure treated woo. He suggested I wait until the next summer to stain it. when the time came I hired a local who came highly recommended. They used a sikkens stain. It turned out horrible and the man hired blamed it on the one he hired to do the work. He offered to come back this year and restain it if I would supply the stain. I would like to use TWP. What do I need to do to get the deck ready for the new stain? I'm 68 y.o. lady and know nothing about this process, except that I paid a lot for a nice deck that now looks pretty awful.....help! Sand before using a deck cleaner and a wood brightener. 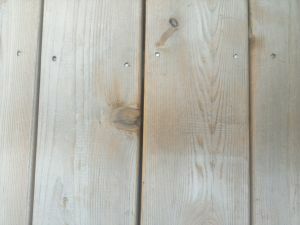 I have removed most but not all of the solid color stain from a wood deck. I need to sand some of the smaller spots off and plan to do so with a 5 inch round hand sander. After stripping the solid stain from a deck the best I can, there are still some small spots of stain that I would like to sand off with a 5 inch hand sander. My question is do I sand BEFORE or AFTER the wood brightener? I am sorry but it is not possible to strip this particular product off. It will have to be sanded, scraped, and/or even replaced. Two summers ago I used the Rustoleum 4X solid stain on my pressure treated garage roof deck and pergola. After the first year the stain had started to lift,peel and crack in various spots and it looks terrible. I want to remove this stain and re-do the deck and pergola with an oil-based stain since this dck is in full sun all day during the summer. My deck is 20X22 so I want to use the options n that s least labor intensive. Will using a stripper work in this case?